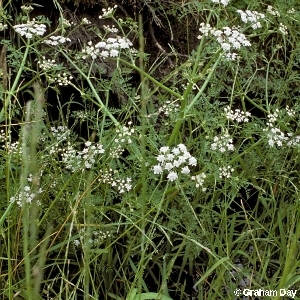 A fairly robust aquatic annual or biennial umbelliferous plant with rather fern-like leaves and each umbel produced opposite a leaf-stalk; reaching 4 ft (120 cm) in height. Occurring in ditches, fens and lake margins; mainly in the Lough Neagh and Erne basins. All names: Oenanthe aquatica (L.) Poiret; Oenanthe phellandrium Lam.